Click on the cover for more information or to order an issue. The Agency, from Think A Like Productions, series follows the adventures of the International Agency of Magic (I.A.M. ), a federal agency comprised of magicians, formed to stop and control magical related crimes around the world. World-wide magic related crime activity has recently increased, as the world is now being threatened by an evil organization called, Horus. While confronting these threats, the Chief of the I.A.M., Embry Eskyll, has ordered his agents to locate and detain an exceptionally gifted but troubled 15 year old, Riley Dean, who appears to have a major role in future events. This series is based on an interesting concept. I have heard that creators have referred to it as part Harry Potter, and part Mission Impossible. Not only do I agree wholeheartedly with that assessment, but I am also seeing this series as part Hell Boy, part Men In Black, and part Agent of Shield, where government agencies have been organized and comprised of special talent to neutralize supernatural threats. I'm not sure if the latter references were used for inspiration, but this is a concept can work for a new series, if carefully and creatively implemented. Fortunately, I can say that Ruben Romero, Bethany Romero, and Roger Cabrera has succeeded in carefully and creatively developing a story and world that is interesting and entertaining. 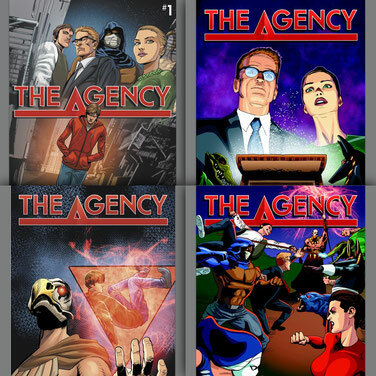 The Agency features some great characters, including the I.A.M. members, Remo, Victoria, Paul, and the enigmatic Ayo. Each member has his or her own unique personality, and they work well together as a team. The 'chosen one', Riley is an interesting character in that, while he is as immature, adventurous, headstrong, and energetic as any typical 15 year old boy, he does has a sense or purpose, as evident in his desire to prevent a robbery of a coffee shop in issue number one. There appears to be a lot of mystery surrounding the I.A.M. Chief, Embry. His motives for wanting Riley are unknown, but he seems to be driven by ulterior motives or mystery forces. To prevent going into spoiler territory, I won't speak anymore on that. While the protagonists are well developed and fleshed-out, I wish that some of the antagonists had been fleshed out a little more. A couple of members of Horus get either little or no dialogue, so their individual personalities were established in the first four issues. As awesome and intimidating as they look, and as formidable as they are in action, at the end of the day, they fall into the 'Bad Guy #1, Bad Guy # 2 category. The artwork in the four reviewed issues is decent, and it complements the story. The colors are vivid, and the magical effects are well-done. The use of character positioning, angles, perspective was well executed, giving each scene the proper level of drama, tension, and excitement. A dynamic sense of motion was portrayed with each panel, and visually, the comic has a cinematic feel to it. While there were no problems with the overall quality of the artwork, there is an issue with the overall consistency. There were some scenes that had a higher level of character and background details, and were more visually polished than other scenes. Another minor gripe, is that I would have liked to have seen a transitory phrase, time, or location reference in a caption in some panels of new scenes, during scene transitions. Sometimes, I would turn the page, and a new scene would begin with no wording, phrases, or information to provide context or set up the new scene. This was in no means disorienting, but a simple word or phrase in some instances would have helped the overall flow of each issue. Despite a few minor issues, I really enjoyed reading issues number one through four of the Agency. This series is definitely worth a time and financial investment. The concept is good, story is well-written and compelling, and the main characters are interesting. I look forward to seeing how the story progresses and the mysteries unfold.